Welcome to another blog post! 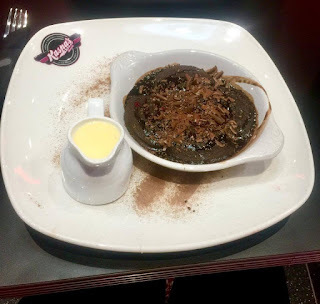 The wonderful guys over at Kaspas Leeds invited me over to their new restaurant to have a look and to try some of their wonderful desserts and treats and I thought that I would talk to you all about it. Kaspa’s are a chain of exciting dessert houses that offer the world’s favourite hot and cold desserts under one roof. Kaspa's menu boasts a mouthwatering selection of desserts including ice creams, waffles, crepes, milkshakes, sundaes and so much more. Kaspa's will change the way you view dessert. At Kaspa's Desserts, their ethos is to create an environment where enjoying authentic desserts with family, friends or anyone that wants to come along is an unforgettable experience. We entered The Core Shopping Centre and walked through the beautiful building until we found Kaspa's. We walked in and was shown over to a marvellous modern table. We sat down in two plush leather chairs and was told how Kaspas works which consists of choosing what you'd like to have, making sure that you know what table you're at (I was at number four) and ordering it at the till which has writing of types of food that are served at Kaspas such as Cakes, Waffles, Milkshakes and so forth above itself. 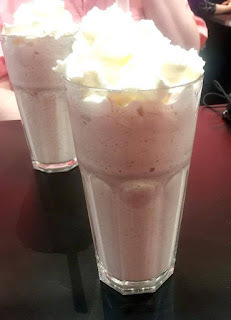 I ordered a Ferrero Rocher Milkshake which I think was just Ferrero Rocher's blended up with milk (I'm not fully sure) which may sound slightly simplistic but sometimes simple is key. I loved the creamy smoothness against the bits of Hazelnut that you got from the blended up Ferrero Rocher's. It just was a massive glass of heaven (if you like Ferrero Rocher's of course.) 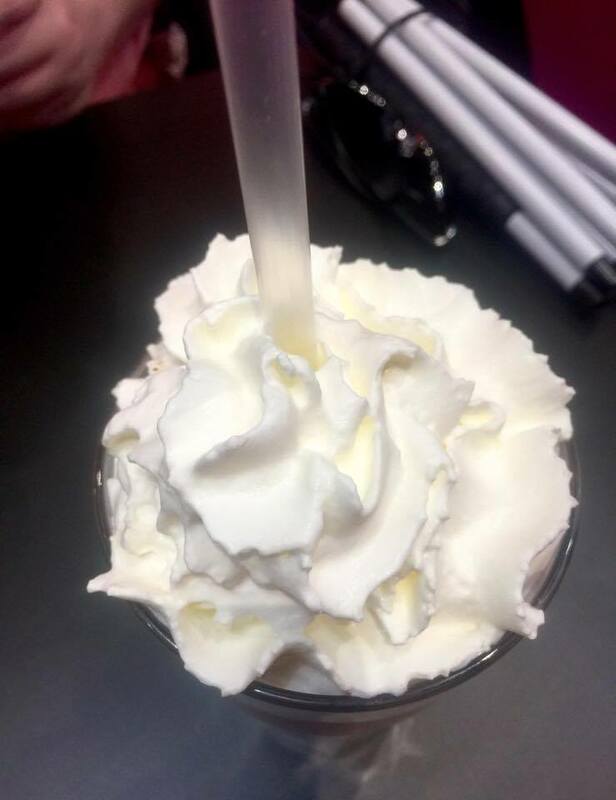 It was garnished with Whipped Cream which I know may sound a bit sickly but weirdly it gave the drink a little bit of freshness. 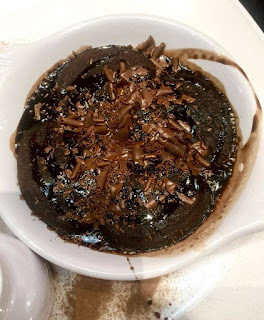 I then ordered the Fudge Brownie Cookie Dough which came with either Whipped Cream, Vanilla Ice Cream or Custard so I decided to be that weird person and go for Custard. I love Brownies and Cookie Dough so this dish was perfect for me and I love a good bit of Custard. The Cookie Dough had pieces of Brownie and the cookie dough had a crispy edge and a gooey middle. When contrasted with the Vanilla Custard, it tasted heavenly as you got a clean vanilla taste against the rich chocolate taste of the cookie dough. I would eat this again and again. I took a guest with me decided to get a KitKat Milkshake and they loved it. They said that it literally tasted like blended KitKats and that they loved getting a bit of crunch every now and again. They did say that it's not for the fainthearted though as they could only drink so much. 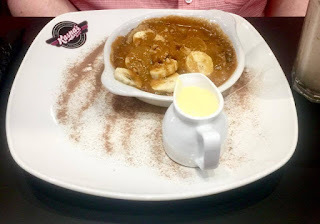 They ordered the Banoffee Cookie Dough with Custard and thought it was delicious especially as it was topped with real Banana pieces and a Toffee sauce which merged inton the cuistard to create a lovely sauce for the dough. They said that they'd love to go back to try some more items from the menu. What's your favourite sweet dessert? Have you been to Kaspa's before? Let me know down below! Thanks to the PR and staff at Kaspa's Leeds for inviting me. Thanks again to the staff for being amazing and for looking after me whilst I was at Kaspa's Leeds. 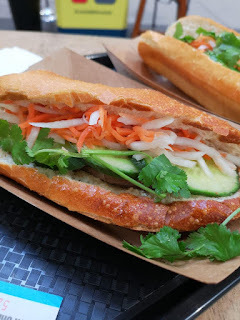 I hope that you've enjoyed this food based blog post and that you come back next time for another new blog post.